Fry the bacon until crispy and drain on a paper towel until cool. Place the bacon bits into a large bowl. Add your mashed potatoes, cheddar cheese, and green onions. Place all of the mashed mixture on the baking pan. Spread the mashed potato mixture evenly across the pan. Place it in the freezer for 30 minutes. Use a circle cookie cutter and cut out circles of the mashed potato mixture. Continue until you have all of the circles cut out. Flour in one bowl, beaten eggs in the second bowl, and the panko crumbs in a third bowl. Dip your potato cake into the flour, then eggs and finally the panko crumbs. 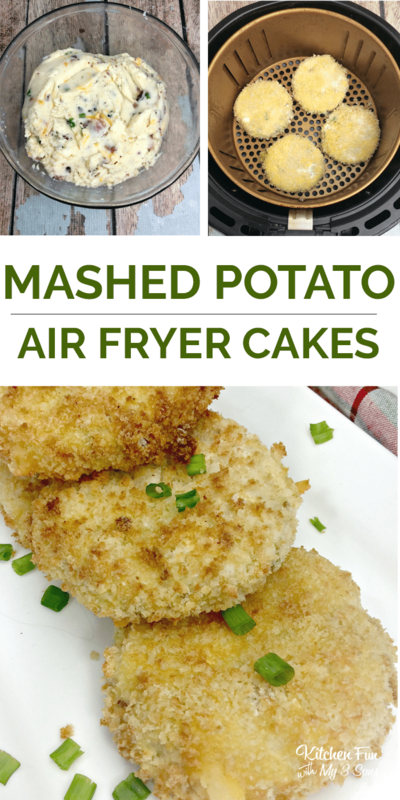 Make sure to ONLY do one layer of the potato cakes in the Air Fryer. Set the temp to 370 for 6-8 minutes.